The NATO war machine is now engaged in its biggest military exercises since the end of the Cold War. Exercise Trident Juncture began on September 28 and continues through to November 6 with exercises taking place in all NATO countries but with major field operations taking place in Portugal, Spain and Italy. The exercises, involving 35,000 personnel, over 200 aircraft and 50 warships is taking place as the confrontation between the United States of American and its dependencies in the NATO war alliance on the one hand and Russia and its allies on the other continues to develop in a very alarming way on two fronts, Syria and Ukraine. The NATO media centre states that the exercise is based on a “fictitious training scenario” termed SOROTAN, developed by the Joint Warfare Centre in Norway and is commanded by German Army Major General Reinhard Wolski, commander of the Centre. They state that the objective is to “assess NATO’s ability to meet projected operational challenges through 2020. What these “projected operational challenges” are, is not stated but we can read the text and subtext of the battle scenario they are using and come to a definite conclusion. That scenario consists of “rising political instability, ethnic tension, and persisting socio-economic challenges in a certain country that are climaxed by a blatant invasion of one state’s territory by another and results in a UN mandated NATO-led response…in a region far from NATO’s home territory” a region they call Cerasia. The fact that OTAN in French and backwards in English means NATO and that SOR becomes ROS, close to RUS, strongly indicates, along with the exercise scenario, that this exercise is aimed at Russia and the real setting is meant to be Ukraine. A few weeks ago an American general stated that NATO can expect Russian “hybrid warfare” operations to take place in the Baltic, and that this was “inevitable.” Since Russia has no motive or interest to conduct such actions this means that we can expect false flag operations by NATO in the Baltic, including violent street demonstrations, destabilization, propaganda and terrorism all of which will be presented as operations conducted by Russia. We can expect similar actions in eastern Ukraine, which best fits the scenario being used in Trident Juncture. Since these exercises are not defensive in nature but openly aggressive, as were a series of other NATO exercises conducted in Europe all spring and summer of this year, these exercises must be condemned by all the peoples of the world. There can be no other conclusion but that Trident Juncture is a preparation for aggressive war and is therefore a threat to the peace, a breach of the peace and constitutes an act of aggression. Therefore, the non-NATO members of the Security Council have every right to bring this to the attention of the Security Council and the people of the world and demand that these war preparations be stopped. Article 3 states that NATO can only act when its member states suffer an armed attack. But in the Trident Juncture scenario there is no armed attack on a NATO country and therefore under the NATO Treaty NATO cannot act. NATO Deputy Secretary General Alexander Vershbow said in relation to Trident Juncture that NATO is concerned about “Russia’s military build-up” from Kaliningrad through the Black Sea, Crimea, to Syria and Turkey.” In other words the NATO overlords are concerned that their aggressive moves in Ukraine, Syria and elsewhere, all directed ultimately at Russia, are being met with resistance and this the western military mafia cannot tolerate. Just a few days after the Trident Juncture exercise began Russian planes began hitting ISIL targets in Syria. On October 7th the NATO mafia were completely surprised by the cruise missile strike launched from the Caspian Sea. A few days later the US aircraft carrier USS Roosevelt, which was supporting the claimed US air strikes on ISIL targets in Syria, left the Persian Gulf, claiming on its website that is mission was over and was a success. A poor cover story but for the first time in a long time, the movement of the Roosevelt out of range of Russian cruise missiles meant there was no American carrier task force stationed in the Gulf. No doubt the Joint Warfare Centre did not take this new scenario into account when planning this massive exercise and we can only hope it upset their plans. Bur what does all this mean for the rest of us? It means escalating anxiety, fear, and insecurity and we seem helpless to do anything about it. But there is a ray of hope and it is coming from Italy. Finally, the moribund anti-war movement seems to be coming to life, and in a significant way. On Saturday October 24th an anti-NATO demonstration was held in Naples organized by the “NO TO NATO” Movement in Italy comprised of dozens of Italian citizens, citizen groups, musicians, writers, artists, civil society groups, the Communist Party, and other communist formations, various anti-fascist committees, women’s organizations and anti-imperialist formations and intellectuals. Another anti-NATO demonstration follows on Monday October 26 in Rome. I salute today’s initiative undertaken by the “No Guerra,” No NATO” Committee which is taking place at the same time as the NATO exercise “Trident Juncture” is underway. The holding of this huge exercise in essence is a provocative show of strength and an attempt to intimidate the Russian Federation and the rest of the world. This represents another step towards the militarization of Europe. NATO is the driving force that is pushing for the continuous militarization of the world and international relations. 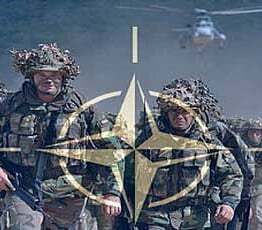 Indeed, at the same time as the peoples in Europe are suffering from the economic crisis and the implementation of austerity policies, NATO is demanding from its members that they increase their military expenditure and armaments. I wish to add my voice to his call for the support of the No To NATO Movement by the citizens of every NATO country, not just in Europe, but in Canada, the United States, and by the citizens of every country, everywhere, who will be the victims of any world war that results from NATO’s continued aggression against the peoples of the world.